Sand in the Vaseline, yes; Vaseline on your bedbugs? True, disgusting story ahead! When I was a kid, we used to remove ticks by putting a smear of Vaseline or clear nail polish over them while they were embedded in the skin, happily supping. They would almost immediately back out, and we would pick them off and flush ’em, secure in the knowledge that the nasty little heads weren’t left attached to skin. The theory was that the Vaseline or nail polish would suffocate them, giving them no choice but to try to get away. This is probably not recommended by health experts the world over for some reason, but it seemed like a good idea at the time. Plus we lived in a nest of ticks. So we were wondering if it’s possible that a layer of some sort of goop or unguent would play hell with bedbugs too. We may have entertained the idea of people sleeping in a thin coat of Vaseline, protecting and moisturizing. This could end up being a public service! We’re not the only ones with this idea, as there is no original thought left in the world, as per usual. But, as with all open relationship and bedbug-related matters, it turns out the answer is “It’s Complicated.” Vaseline on the bed legs is a messy endeavor, and while it reportedly does work as a barrier, there is some controversy on isolating the bed, and this may actually prolong your ultimate bedbug infestation. 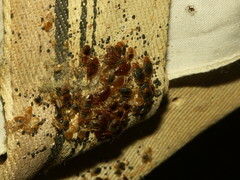 The bedbugs will steer clear of the bed, but you are more likely to get bitten at other times throughout the day. While largely nocturnal bed lovers, bedbugs still never met a Barcalounger they didn’t like if the need to follow the food presents itself. So you avoid bites in bed, which is certainly a noble interest, as who likes being a captive audience, but the bedbugs are likely to disperse beyond the area nearest the bed, so you’re looking at treating a larger area. Some people swear by traps for the legs of beds, like the Climbup Insect Interceptor Bed Bug Trap , and if you want to use those, it’s important to let the trap functioned as designed and actually trap the bugs. Think about it: would you rather the bedbugs die a hideous death in a little cup of mineral or tea tree oil in one of these traps, or just shrug and retreat to the TV room? If preventing bites is extremely important because of a severe bite allergy, then it might be possible to add the vaseline as a fall-back method on the bed frame if you think the critters are doing something besides marching up from the floor.